Gabriel Dinda doesn’t need much of an introduction. If you read the Daily Nation, you will find an article authored by him. If you google him, you will find several interviews done about him, by the top dailies and TV stations. He is best known as the Founder of Writers Guild, Kenya, a writers’ incubation centre that he founded when he was a student at Kenyatta University in 2014. Writers Guild was the writing partner of Chinese billionaire entrepreneur Jack Ma’s visit to Nailab last year. 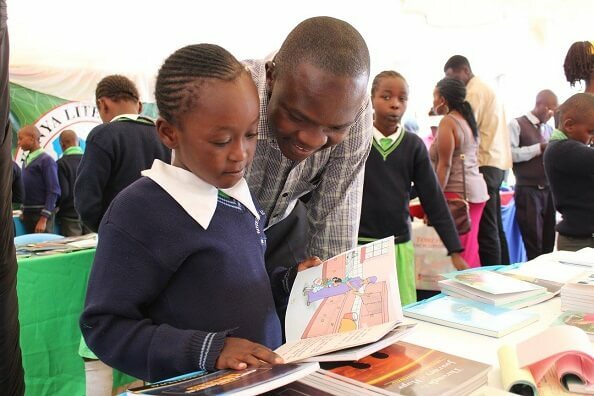 They have published 22 books so far, including one written in Kiswahili. Most of the books published are those of first-time authors. He has a scar on his forehead which he chooses to call a story. It was not part of his life before the 13th of July, 2018. He acquired the scar in an accident in Ntulele area, Narok County while on a night bus travelling home. He fell asleep as soon as he was seated. At about 1.30 am, he woke up to the rescuers asking, “Hawa bado wako hai?” (Are these ones still alive?). He had not heard the impact of the crash. He was divinely asleep, because it was that sleep, he says, that saved him from experiencing the horrors of the impact. He was among the most injured, with wounds on his face, chest and leg. Fortunately, he started feeling the pain when he arrived at the hospital. All along he had been feeling the pain of another; a woman whose injuries were far much worse than his. Many years ago, before he got this story to tell, he spent his childhood in the plains of HomaBay. In his words, he grew up in an ordinary setting, the sixth born in a family of eight siblings. He remembers the moment when he transferred from Lorateng’ Primary School to Majiwa Primary School: having learnt that the latter had produced a KCPE candidate with more than 400 points, a first in the area, he simply walked out of his old school and into this new school, with the uniform of his old school. It was only a week later that he went to school with the right uniform. He went on to score 393 points in KCPE when his time came; again, among the first in the area. Gabriel is currently a Graduate Assistant in the School of Humanities and Social Sciences (SHSS) while pursuing a Masters of Applied Philosophy and Ethics (MAPE). His writing posed questions that he was unable to answer on his own. “Circumstances chose my undergraduate course, in Economics and Finance. MAPE, for me, is unique in that I made an independent choice to pursue it. My journey to MAPE began when I started asking basic yet profound questions in my writing. What does it mean to look forward to something? What then happens to the present moment then? What is life? What next after death? MAPE is already doing a good job answering them, about the human person and the complexities of today,” he explains. Every Friday afternoon, from 2pm to 5pm, Writers Guild, Kenya runs the Writers Ekklessia, a weekly forum held at the National Museums of Kenya. This forum, whose name is borrowed from the Greek and means assembly, invites experienced writers, publishers and editors to share their knowledge with upcoming writers. He is a person who is optimistic about the writing space in Kenya as he believes that, contrary to common opinion, Kenyans are writers and readers.